PrimeAire has experience and successful project completions in New York and New Jersey evolving into a most cost effective and reliable environmental group. Regardless of the size or complexity of your residential or commercial project, environmental contracting calls for highly specialized skills and knowledge from start to finish. We do it right. 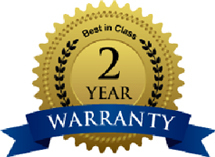 Our experience and expertise when it comes to dealing with hazardous substances and materials ensures that your mold problem will be dealt with quickly, safely, and efficiently. Mold contamination, a common occurrence in water-damaged buildings, is a proven serious health risk; immediate removal is key. Maintaining your home and protecting your family from avoidable disease are two good reasons to assess the potential impact of mold on your home. Many families wait until mold contamination is very high before acting to correct this problem. If the home or building has had current or past water damage, particularly to building materials, a microbial investigation is warranted. Removal of all items including furniture from the infected area prior to setting up containment is necessary. If items are moved from one room to another they must be HEPA vacuumed and cleansed with mold inhibiting chemicals. Extreme situations may require that all items/furniture in the infected area be cleaned under negative air pressure before anything can be moved. Sealing off the work area by covering floor and door openings with polyethylene sheeting prevents contaminants (toxic mold) from spreading to the rest of the building. Removing and sanding growth areas on building materials such as drywall, plywood, insulation and framing. Removal of damaged materials is executed under negative air pressure through HEPA filtration followed by bagging and disposal of waste. During this process, PrimeAire will use disposable coveralls and respirators with HEPA filters for protection against toxic mold. 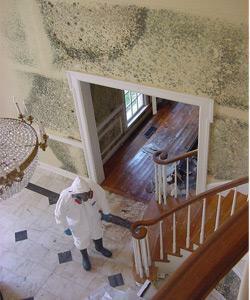 Applying mold inhibiting chemicals to exposed surfaces prevents the re-growth of toxic mold. 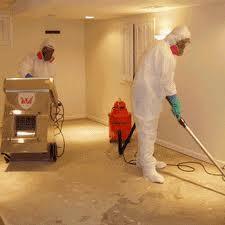 Remediation verification can be requested at this point to confirm the accomplishment of the mold removal project. 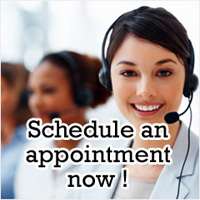 Providing reconstruction services. If moisture is present, dehumidification systems are used until all exposed areas are dry. New materials can then be installed, restoring the area to its original, purified state. 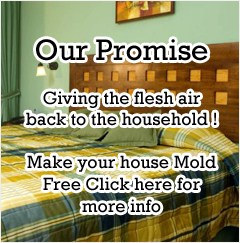 Call PrimeAire Mold Services at 1-877-307-5166 to speak to a Live Certified Mold Professional today.